Two days on a long wooden boat cruising down one of the world’s great waterways. 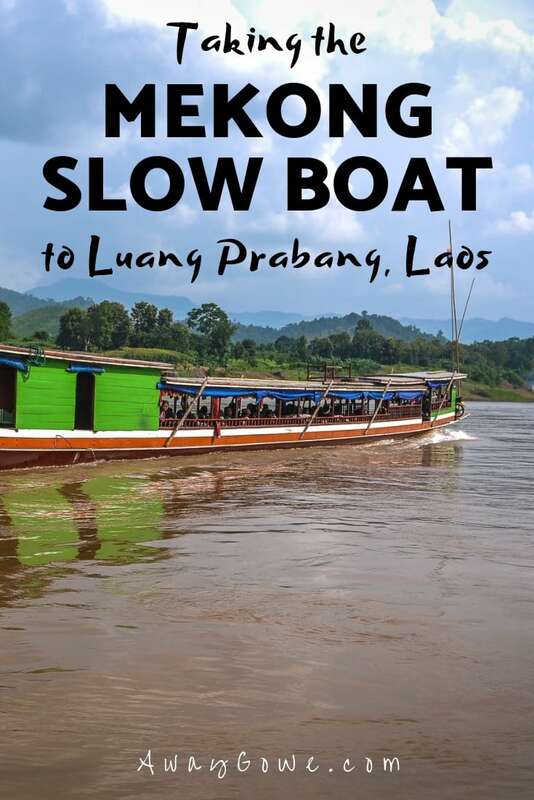 Read on for our full report on riding the “slow boat” from Thailand to Luang Prabang. Taking the “slow boat” from Chiang Kong — on the Laos-Thailand border — to Luang Prabang — one of the great heritage cities of Southeast Asia — is a unique, once-in-a-lifetime experience that takes you past the natural and cultural wonders of the Mighty Mekong in relative comfort over two days. As of 2017, the slow boat from Huay Kai/ Pakbeng to Luang Prabang no longer drops passengers at the main pier near the Royal Palace in the center of town. Rather, the new terminus is located past the airport, about four miles up river from the town center. Being something of a purist (read: masochist) when I travel, I was a bit disappointed to learn that current boats plying this route are quite comfortable and touristic. Nevertheless, this journey still remains one of the top transport highlights of our time living and traveling through Southeast Asia. Really, how often to you get to spend two days floating down one of the world’s great rivers with no responsibility but to take it all in? We opted to arrange travel from Chiang Mai (Thailand) to Luang Prabang (Laos) via the Mekong River through a travel agent in Chiang Mai. Contrary to logic, this seemed to be the most common way of doing the slow boat from the Thai border, rather than trying to piece everything together ourselves. We usually prefer to travel independently, but in this instance it seemed to make sense to purchase a joint ticket in which all transport and the first night of lodging were arranged by the travel agent. DAY 1 — Departed guesthouse in Chiang Mai around 11am; stopped at a cashew factory/store for lunch (local food) and the White Palace in Chiang Rai for 30-40 minutes; Arrived in the border town of Chiang Khong around 3-4pm; Dinner at guesthouse and overnight stay in Chiang Khong. DAY 2 — Ate breakfast at 7am and departed guesthouse between 9-10am for the ferry to cross the river to Laos; Crossed river to Huay Xai, Laos; bought visa just up the road and passed through Laos immigration; Departed on river boat to Pakbeng around noon. Arrived in Pakbeng around 5pm and secured our accommodation for the night (not included in joint ticket). DAY 3 — Departed Pakbeng around 9am, arrived in Luang Prabang around 4pm. For one, times listed here are actual times, not the times we were told, which is important given that we were told something very different than what actually took place. For example, we were told that would be picked up in Chiang Mai between 10 and 10:30, but it ended up being closer to 11:30 and some of our crew had to wait until noon as our minivan made its rounds picking other passengers up. The agent also told us that the slow boat would leave Huy Xai at 9am, but it was in fact closer to noon. The boat basically leaves when the boat leaves. I wouldn’t believe anyone who says otherwise. We were also told that it would take seven hours to get from Huy Xai to Pakbeng on the first day, and 10 hours to get from Pakbeng to Luang Prabang on the second day. This was a drastic over-estimation but we actually think this had to do with the speed of the river this time of year (it was late October and right on the heels of the rainy season—very high and very fast with the current). Something else to take into consideration is that, regardless of being called the “slow boat” it can be quite the speedy trip, especially if it is the rainy season and the waters are running high. In the rainy season, I wouldn’t take the boat expecting a mind-numbing lazy amble down the mighty river. We found the boat refreshingly swift, yet never felt it was anything close to dangerous. I think the main reason it is called the slow boat is to differentiate it from the other travel option: the very aptly named “fast boat” which we saw on a number of occasions buzzing by at lightning speed dodging barely visible boulders, logs, and other craziness. The fast boat covers the same amount of distance as the two-day slow boat journey but in a matter of hours. However, the time saved comes at a price and Pakbeng is full of people with tales to tell of grizzly accidents. Prior to buying our tickets in Chiang Mai, some travelers urged us to buy seat cushions for the long trip claiming that the slow boat seats were wooden benches and could get extremely uncomfortable after several hours of traveling. Yet, we heard from others that bench seats were a thing of the past and now all boats were outfitted with comfy airline-style seating.Turns out, both camps were correct. The day we departed from Huay Xai, two boats made the journey. We were on the first boat, which was outfitted entirely with seats transplanted straight from a couple dozen minivans. They were indeed quite comfortable and far more luxurious than we had expected. However, the second boat, which left right after us, was not outfitted in this way — most of those passengers made the journey on wooden benches or even on the floor. Not sure of which type of seating we could expect — and being the chronically frugal travelers we are — we thought we’d split the difference and buy one cushion that we both could share back and forth (they were sold at our guesthouse in Chiang Khong). As we found ourselves with comfy seats on the second day as well, we didn’t end up needing the cushion after all. But my feeling on the matter is that as long as guesthouses are selling the cushions in Huy Xai then there’s a chance that some of the boats running the route are still outfitted with wooden benches. Something else worth noting is that we were given assigned seat numbers on our tickets. While there were handwritten numbers on small pieces of paper laid out on many of the seats the first day of travel, many of the other passengers did not have assigned seats and no one seemed to pay any attention to the pieces of paper. We were some of the last passengers on the first boat out, but weren’t concerned about our seating options because we believed we had assigned seats. By the time we boarded, the pieces of paper had been shuffled all around and we got stuck up in the least desirable seats on the boat — facing each at the very front of the long boat. Being the last to board did have one big advantage — our luggage went into the overflow room where it was easily accessible while the rest were buried under a hatch. This meant that we had a head start on securing accommodation when the boat arrived in Pakbeng and everyone else had to wait for their luggage to be unearthed.